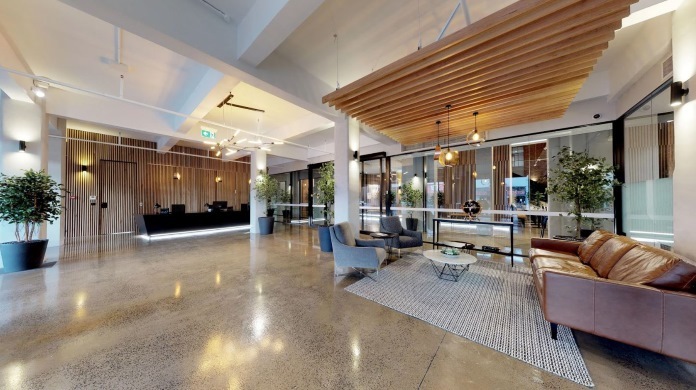 United Co., set in the heart of buzzing Fitzroy, is Melbourne’s newest business and innovation centre with collaborative work spaces and luxury offices which has been masterfully created out of the bones of one of Melbourne’s oldest commercial buildings on Smith Street. The resultant centre, which feels much more like a precinct, is modern in feel, generous in size, rich in style and buzzing with the latest technology – yet sympathetic to its grand origins. Original brick pillars and other features such as the building’s lift shaft have been retained and incorporated into the building’s stunningly designed layout, further complemented by its luxurious fit out. Al Jeffery, Community Architect and Wellbeing Facilitator for United Co., says “United Co. is a unique opportunity for entrepreneurs and small to medium sized businesses to be part of what is quickly becoming one of Australia’s leading collaborative work spaces and is attracting interest from all over the country. Since opening, United Co. has reached out to various professional bodies, local meet up groups and business networks, offering meeting and gathering spaces free of charge. “We want to become the heartbeat of business and innovation in Melbourne, offering local business networks a wonderful space where they can meet and undertake networking, informational and community events,” Al Jeffery said. “Our space is a far cry from the business parks of the past, relegated to the outskirts of cities. United Co. is placed right in the centre of Fitzroy, a creative hub, in a building that showcases the unique aesthetic of the area. In the coming month, United Co. will be launching its range of curated and high quality networking and educational events to gather the community of organisations, entrepreneurs and creatives who would like to be part of the buzzing community. “United Co. is driven by creating human-centred spaces that drive community, innovation and impact. Supporting not only our businesses, but also the people in them is what we are here to do,” Al Jeffery added.